I am guessing it was a 280SE, circa 1970. 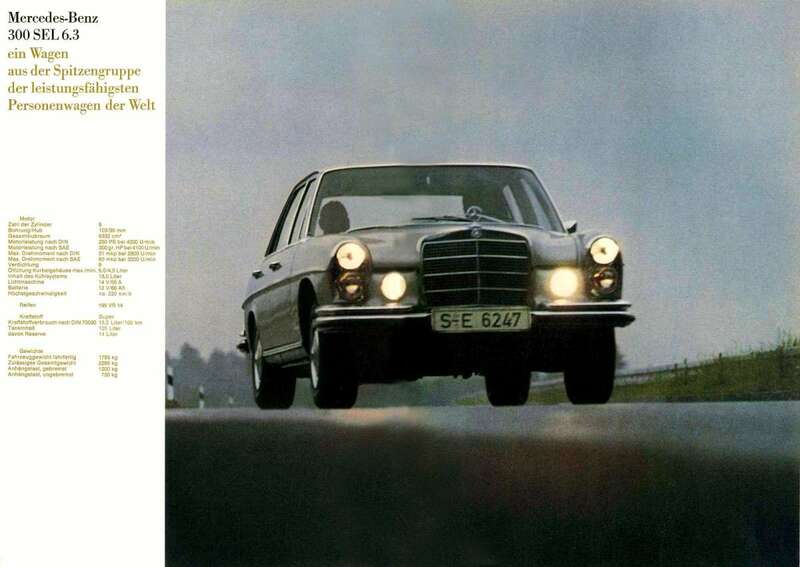 My favorite version would have to be the 300SEL 6.3, with the big V8 from the 600 limo. Grace and pace! You’re right, that Berretta is BRIGHT! That’s what caught my eye first! If I was wealthy I would drive a 300SEL 6.3 for my everyday car. Lovin’ the Beretta. That’s about it. Have a nice day. Yeah, and pie at Village Inn for dessert! There’s not a car in that picture that is less than 10 years old. That alone would be a rare sight in my area (Eastern PA). I owned a 91 Beretta GT in the same color a few years ago. Purple lettering on the door, body matching basket-weave wheels. Thankfully it had the 5 speed with the 3.1 V6, which made it a lot of fun, it would roast the tires if you stood on it in first. Should have kept it. That had to be a fun fun car to drive. I drove a 5-speed 2.8 Beretta and loved it. It doesn’t get much better than the 300SEL and the 600swb. We have a 94 Beretta in navy blue metallic in a storage unit acquired from a relative. Since it is not registered and plated and stored underneath a cover in a garage, it’s covered by the building’s insurance. I have been keeping it around to replace the Century as the Beretta has only 77k gently used miles. The new for 94 L82 3100 V6 will really scoot in a lightweight car like that reminds me of my Z24. I imagine a 5speed version would be fun since that engine has higher peak points. The Quad 4 HO with 5 speeds were extremely fast if you could stand the commotion. Ours is a base model so it doesn’t have all the lip kits but has the upgraded 15″ alloys and looks good. Every “sporty” car in the early 90s seemed to have variants of those colors, aqua, purple, greens, domestic and import alike. That white car we see the rear of making a left turn appears to be an Audi A4 but with an aftermarket? spoiler I have never seen an Audi with a spoiler like that or the same difference Passat for that matter. You don’t see too many pre 80s M-B around here, in 1970, Charlotte didn’t have the transplant population it does now and the rednecks either didn’t have the money or inclination to buy foreign. In Michigan, the reasons are self explanatory. We have Steak ‘N Shakes here but I haven’t seen a Village Inn in years. Actually on further reflection, it looks like it might actually be an Audi 80/90 from early 90s, back when VW/Audi was on life support in the US. This whole picture looks like it could be 10 years old or more. Actually the white Audi in the picture is an example of the 4th-generation 100/A6 series (1992-97). I was going to ask Tom if it was a Ur-S4. Although they are pretty cars, I would never own one due to the high repair and parts prices. UrS4/S6 are more likely to be in good condition and still on the road than the C4 A6 these days. I own a ’95 S6 myself, and I have to say they aren’t that expensive to maintain. Compared to other eighteen year old cars, that is. The engine and transmission are iron-clad. Well yes and no. The Century and Grand Am of those styles were made until 2005. With the best looking front end ever offered on a 108. Hated the Euro one-piece lamps. And the larger amber running lights on the 70+ models fit the front perfectly for scale and placement. I don’t get it when sellers advertise Euro lamps in their ads for these cars, those take away value. The European lamps are so much brighter than those on the US models. Most enthusiast prefer the European lamps because of the extra brightness. In my opinion some foreign cars look better with European lamps, some do not, but the advantage is obvious when driving at night. I have a 126 bodied car. When I have ridden in those with Euro lamps the difference is outstanding. They make my car seem as though I have one candle on each fender. My 126 is the same way. Terribly inadequate headlights. Which one do you have? I have an 87 300SDL that I have owned since it was 4 years old. It’s an adult now. 1989 300SE, but still looking for a top-nick 560SEL. Fellow CCers, please let me know if you see one for sale! while I admit to find both headlight-set ups equally charming, the one-piece-a-side headlight treatment you refer to was found on lesser models only. the bigger engines all had the stacked-double-lamps-on-each-side treatment, also in Europe. Whats interesting is that the whole intersection seems to be filled with semi odd/old cars, the Century and Grand Am are common, but living Berettas are getting rare, the Benzo of course, and I can’t recall the last time I saw an Audi of that vintage outside of a U-pick/U-pull yard. Funny thing, I didn’t even notice the other cars until after this post went up! The aqua Beretta and Audi 100 are certainly CC-worthy. A neighbor has a Century Limited like that blue one; hers has navy leather too. I’m half thinking of asking if she ever wants to sell it. I knd of like the Century also. Went with my Dad car shopping in December of 1999 and we test drove one. It was really more comfortable than the 2000 Impala he eventually bought. He felt the Century was too much like the 92 Cutlass he was trading in. I’m pretty sure I see more W108s than Berrettas these days. Which is sad. I always thought the Berretta was a particularly attractive car. It’s the other way around here; while not near as common as A-body Centurys and Cieras, there are still plenty on the road. A friend used to have a dark red and silver two-tone ’89 Beretta with the four-spoke styled wheels and red interior. It was pretty sharp and gave her good service. It was traded in on a new ’96 Accord EX coupe. The last time I saw a Beratta was a few months ago. I remember thinking “Wow I haven’t seen one of those in years!”. I really haven’t seen any Corsicas in a very long time either. It’s odd how certain cars that really aren’t that old disappear much quicker than others. Most likely because when new, the majority were bought by younger drivers who drove them a lot harder than senior citizens driving their Buicks and Oldsmobiles. I see a lot more Berettas than I do Corsicas now a days but they’re dwindling and the ones I see are really nasty. I almost never see W108s anymore. Any pre W126 is a rare sight around here. In Indianapolis, we are lousy with Steak ‘n Shakes. I can Takhomasak any time I want. There is one about a mile down the road from my house where I have shot a couple of CCs in the recent past. I grew up on Steak ‘N Shake. I know it’s only a half-step above McD’s and Wendy’s, but I love Steakburgers and their chili! I had to google the Beretta and Steak ‘n Shake. I think neither one gained much traction here in SoCal (nearest S&S – Vegas?). Now the Mercedes is quite another matter. Though there are many old ones around here that particular model is rarely seen anymore. But you never know – today I saw a decrepit white 62 Dodge convertible with gold on black plates (original) with an elderly lady behind the wheel. At times the streets on the west side of LA resemble a moving museum of automotive history. Nothing like a benign climate and the remnants of a great car culture to preserve them so well. The MB W108 was quite common in L.A., in fact, my brother’s first car, bought used in about 1974, was a ’66 250S version, he drove it for years, and did it ever become a money pit. And a guy I worked with in Westwood way back had a new ’72 280SEL 4.5, although those models were only built for two years, I think. The MB culture was just catching on about then. But you’re right, you don’t see many around any more. No matter where I’ve lived in Southern Cal, it has always been a repository of automotive history, seems you routinely run across examples of long ago models, no matter what year it was. As for Steak ‘n Shake, well, never heard of it until today. With unlimited funds I would probably get a 300SL, an Alfa Romeo Tipo 33 Stradale or an F40. But in the real world, my absolute dream car is a W108 or W109. I would probably want the less complex W108. I would completely restore it and update it like MB would have done today; a bit more power, climate control, sound system and such. All completely in tune with the original car’s look. Great photo. 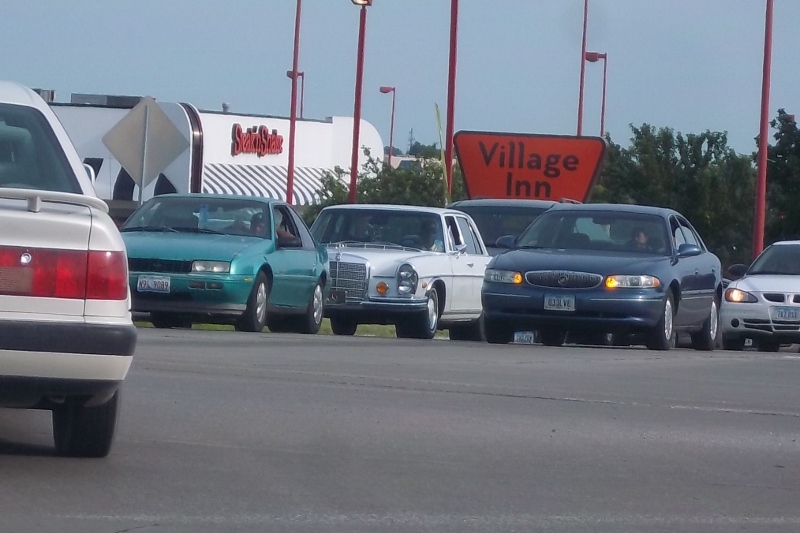 The Beretta totally jumped out at me first, but of course the Mercedes is the oldest so it deserves a highlight. The Audi is not that commonly seen, either.